This upper-intermediate ESL lesson plan is the second of three lessons on technology. 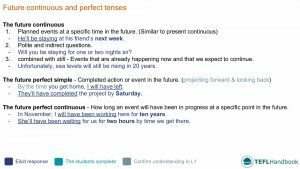 It contains activities, games and resources for teaching English students how to to use the future perfect and continuous tenses. Also, if you use an iOS or Android device, you can get offline access to these materials through the TEFL Handbook app. Step through each tense with your students and focus on their functional application. Try to elicit examples and add the best ones to the board. Students will work in pairs to create grammatically correct sentences, using the idioms from the previous lesson's game and future tenses. Try to elicit the meaning of the idioms (See the game from lesson 1). Next, divide the students into pairs or groups of three and have them write a statement for each prompt. They may use two sentences if they wish. If they do, they should be contextually or logically connected. Encourage the use of dictionaries or smartphones if they are available. 1. Tomorrow evening, they'll be pulling the plug on this whole project. 2. Steve will have already hit the panic button by the time they arrive. 3. Before the end of the March deadline, they'll have been running like a well-oiled machine for months. 5. We're having a meeting about the finances tomorrow. Hopefully, they're on the same wavelength. Students will work in pairs to talk about the future. 1. possible for humans in 100 years. 2. will have disappeared 100 years from now. 3. event that takes place next year. 5. as soon as you can afford it. 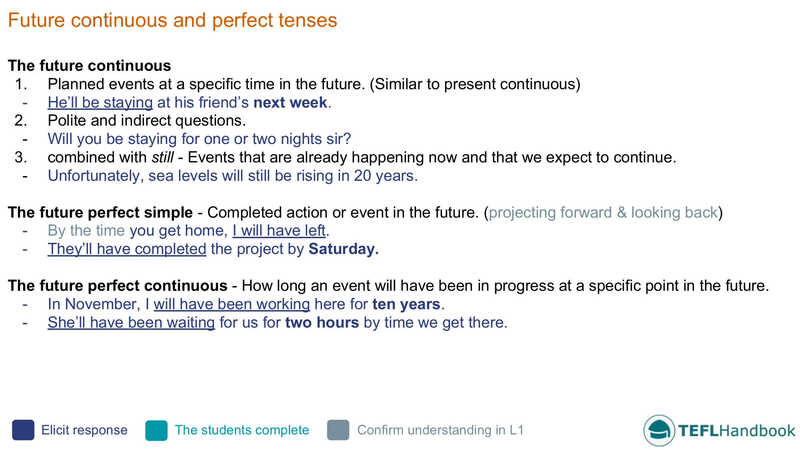 Before they begin, elicit which tenses they might use for each and why. Finally, the students will take turns talking about the future. They should tell their partner something for each of the prompts. Encourage your students to ask questions and give their own opinions on their partner's thoughts. Students have to read and summarise an article where an influential figure talks about the societal impact of a specific technology. Tell your students that they will have to answer questions about their chosen article at the beginning of the next lesson, and give their own opinion on the topic and their subject's thoughts. Add this outline to the board and tell your students to use it to plan their summaries. They don't have to follow it exactly. 1st paragraph: Description of the technology and possible benefits to humanity. 2nd paragraph: The subject's concerns and what qualifies their opinion. 3rd paragraph: Your thoughts and opinion. Students have to mime everyday items of technology while their teammates try to guess the correct answer. Start by dividing the class into two teams and have each side select their performer. On each turn, write down the name of five gadgets/inventions on a piece of paper and give it to the performing student. That student must then represent these to their team using only gestures. Their teammates earn a point when they guess it correctly. Set a stopwatch for two minutes. The team with the most points or best time wins. We hope that you found a few of these ideas useful. Our next free lesson in this series is on expressing certainty and possibility. Also, Be sure to bookmark our complete list of upper-intermediate level ESL lesson plans, as well as our entire collection of ESL courses.